Alicia Landa hosts a monthly Peace Walk at Windermere. Here are sharings from two participants in this month’s peace walk. What a Blessing to participate in the Peace Walk at our beloved Windermere on Sunday, 6th January, sponsored by IIWP [Institute for Individual and World Peace]. From the beauty of the land welcoming us, to the fresh quality in the air after the rain, to our joyous sharing of our picnic lunch in the glorious barn, it felt like a huge blessing from beginning to end… And for me, the deeper level of peace I’m continuing to experience is developing greater depth, vibrancy, and aliveness! 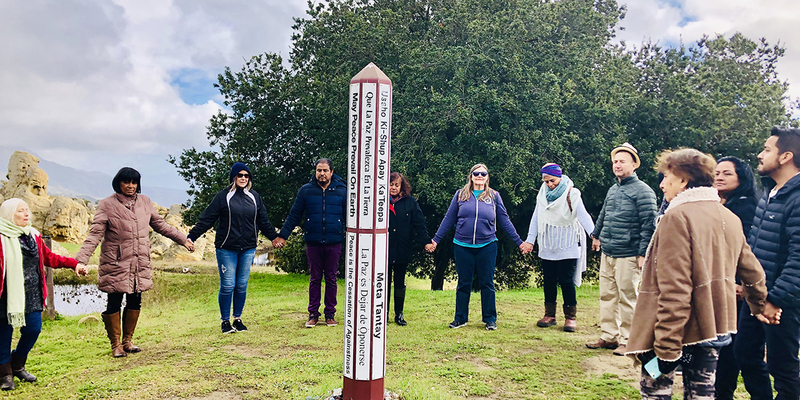 With around 20 folks participating from a variety of cultures, we had a joyous time reading words of peace from our magnificent Peace Pole, after a beautiful meditation and Peace Walk, before placing our unique blessings on the land. The beauty, peace and majesty of the land is truly a blessing to be experienced! Coming back to LA, it felt as though we were riding on a cloud of peace, and that sweet, peace-full majesty is certainly continuing for me!! Thanks beyond thanks to all who made this possible, and most importantly to our blessed land for graciously receiving us and sharing the ongoing wisdom. For me, the gift of the Windermere Peace Walk began the night before in preparing for the walk, calling to see what weather possibilities were up – rain, wind, cold, and maybe sunshine. It was waking in the early morning to do my spiritual ritual and including blessings forward to the van ride, the driver, the group of sleepy, eager participants riding up in the van and all our fellow travelers on the highway. The gift of the Windermere Peace Walk continued to unfold in the sweet, Spirit-full connection of the van riders, and the peaceful, sinuously spiraling, open roadway climbing into the sky of Santa Barbara, winding along ocean beaches and creating space to stop off along a beach paralleled by a train track. We all climbed out of the van to breathe in the breaking ocean waves, collectively wishing for a train that came zooming by minutes later, bathing us in more Windermere peace energy. We arrived on the property, the closed gate giving us an opportunity to move more deeply into peace energy as we waited for a driver and jeep to let us in. Then with the kind greeting of those that had already arrived, the two groups joined into a multi-lingual group of oneness. 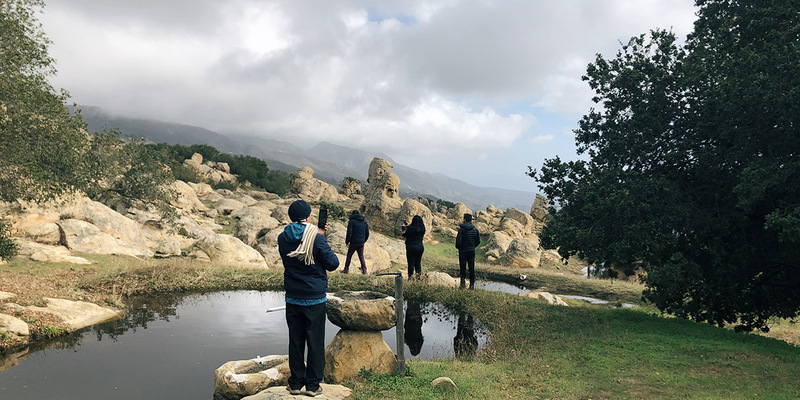 We walked and walked the land, praying and breathing deeply; seeing, hearing and feeling the vast harmony of Mother Earth harmonizing our spirits. We shared thoughts and feelings, reflections, laughed and were still. We ate, sang Happy Birthday, meditated and walked slowly back to our vehicles to begin our return from the Land of Windermere. Some of us left – perhaps all of us – moving in a new harmonic of well-being, of inner and interconnectedness of peace and stillness. I know I did. P.S. Much love and gratitude to our facilitators, Matt and Alicia, to the assisting team, Moises, Veronica, and Raul, and special love hugs to Achilles, the guide dog, for his cozy snoozing and general cuteness.